Corned beef and sauerkraut combine to make this long standing favorite sandwich. 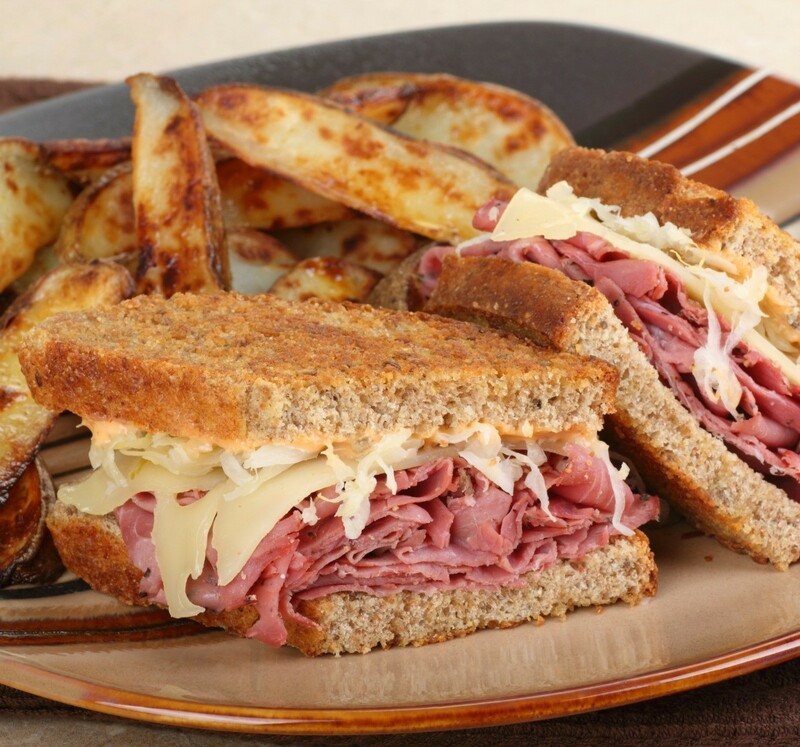 This page contains Reuben sandwich recipes. Serve open-faced on small slices of rye or wheat bread. Preheat oven to 350 degrees F. Cut bread horizontally to make 4 slices each about 1 inch thick. Spread bottom slice with part of dressing. Flake corned beef in a bowl with a fork. Arrange a third of the beef on this slice. Top with a third of sauerkraut and 2 pieces of cheese. Spread both sides of the next slice with dressing and place on top of cheese. Top with third of sauerkraut, corned beef and 2 pieces of cheese. Spread both sides of third slice of bread and top with remainder of sauerkraut, corned beef and last 2 slices of cheese. Spread top crust of bread on bottom side with last of dressing. Combine first 3 ingredients and set mixture aside. Spread 1/4 tsp. butter on each slice of bread. Place a half slice of corned beef on each piece of buttered bread, folding beef to fit. Top each with about 1/2 tsp. sauce mixture, 1 tsp. sauerkraut, and a piece of cheese. Place bread slices on baking sheets, broil 8 inches from heat 2-3 minutes or until cheese melts.